When it comes to innovation and improvement, Virginia Mason recognizes that patients are a valuable resource. This is especially true in the Peer Partners program. Former joint replacement patients who were asked what could be done to improve their experience, said they wished they had been able to talk with someone who had already had a hip or knee replacement at Virginia Mason. Then they would have known what to expect during surgery and post-surgery rehabilitation. The one-on-one experience is so positive, many patients decide to volunteer before they leave the hospital. Patient Relations Program Manager Ann Hagensen, RN, realized the value of that suggestion. She and her team worked with patients to design the Peer Partners program. Now in its third year, the program trains former patients to become volunteer peer partners. The volunteers round on the orthopedics unit, visiting patients. They also attend pre-surgical classes to reinforce the knee and hip surgery protocols. In an orientation session, peer partners are prepared to visit with patients by learning communication techniques that help them listen for topics that matter most to the patient and encourage patients by talking about the activities they are excited to return to, now that they have a new joint. Kent credits the Patient Relations training with transforming the way he communicates in all aspects of his life. 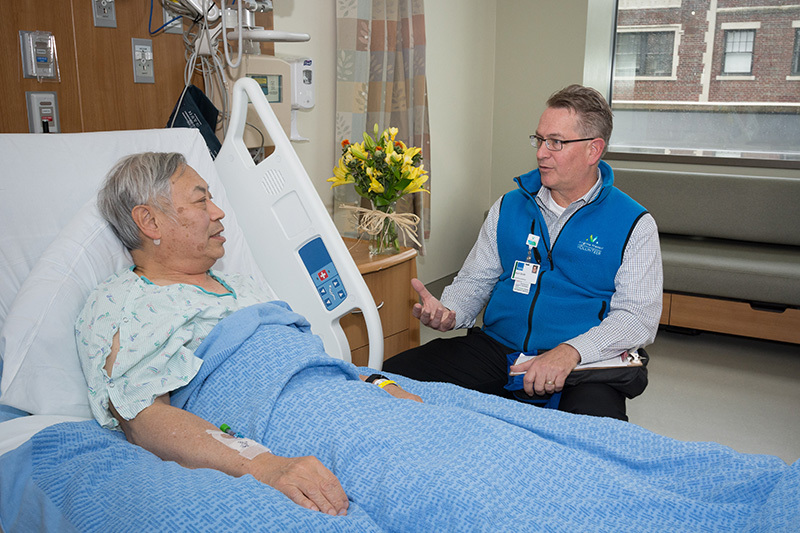 Kent Smith (right) and hip replacement patient, Wayne Lau, talk about their hip replacement experiences and how the surgery will impact their tennis game. Kent is not alone in his enthusiasm for the Peer Partners program. Ann says the one-on-one experience is so positive that many patients decide to volunteer before they leave the hospital, returning six months later for their training.